Your team is on offense now and you're standing on the perimeter(outside the key/painted area, outside the 3 point line) or moving without the ball, looking to receive a pass. You get the ball, establish a pivot foot, and face up on your defender. You are now in the TRIPLE THREAT POSITION. This is a very strong position to be in, before you put the ball on the floor. 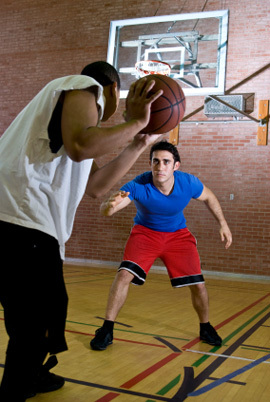 Your defender is at a disadvantage here since he/she doesn't know which of the 3 you're going to do. USE THIS TO YOUR ADVANTAGE. Keep the ball close to your body. Hold it tightly with both hands and have it touching your right hip if you're using a left pivot. Remember, same thing applies here as does in dribbling. Protect the ball with your body. If you keep the ball in front of you, leaving it exposed, the defender can take it from you or strip it from you. Here's a video from MVP.com featuring Michael Jordan; he talks about the triple threat position and the jab step.